TechHive Fall 2017: Day 6 // The AR Box Experience! After five weeks of solid skills building using Scratch, Hummingbird, Arduino, app development, and physical prototyping..... We were finally ready to talk about our final project! Our interns will work on this for the next few weeks and will showcase their interactive exhibits on the museum floor at Lawrence Hall of Science on December 2nd! Our final project has many complex, but interactive and fun, components. 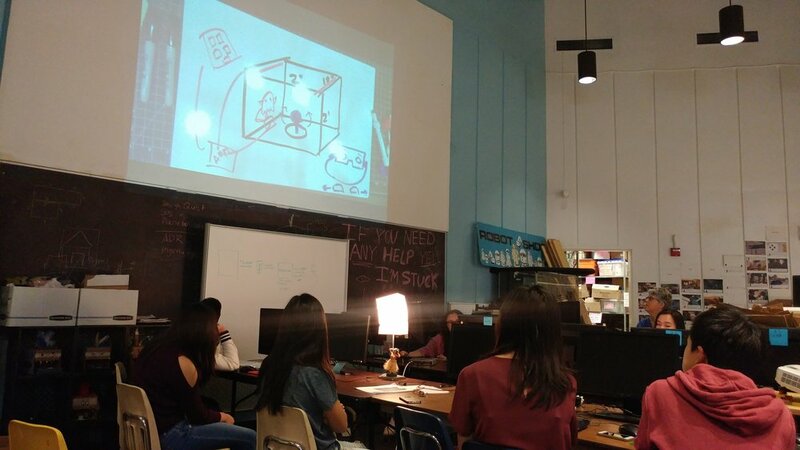 Each team plans on building an augmented reality environment within their box that will use a rotating Rasberry Pi camera module inside to stream via Wi-Fi to a Google Cardboard virtual reality viewer. Our interns will use arduinos to program interactive components inside the box which will be controlled by an app that they develop. The goal is to provide an educational and immersive experience for both parents and children! Since we are at the Lawrence Hall of Science, each team chose a theme related to some aspect of science. Team TRAP SQUAD (Jessie, Emanuel, Karthika, Annette, Claire, Catherine) chose a theme on energy with a focus on urban infrastructure, sustainability, and renewable energy. They are planning a visual demonstration about how energy consumption and carbon footprints affect an urban landscape. Team JAKE PAULERS (Maxim, Matan, Kobe) took an astronomy related approach. They are planning an interactive space journey through the universe, viewing gas giants, modeling binary star systems and more. Team ON POINT SQUAD (Aesha, Steven, Emily, Jenna) decided to take a natural science focus. They are planing on building their box around the four seasons and how they effect the Earth. They are planning a visual display of a cherry blossom tree through the seasons and also plan to tell the story of a tiger's life through time. Team THE PIGEONS (Yasmin, Yazmin, Jennifer) focused on a more environmental science related theme. They are planning an interactive journey through redwood forests and teaching about the animals and the environment within, such as the rivers and trees. Our TechHive Interns have great ideas and we are excited for them to design and implement their VR/AR experience with visitors in December! Newer PostTechHive Fall 2017: Day 6 // "The Essence of a Good Resume"